Brian Aldiss has told a story (and I have no reason to doubt it) in which he, Arthur C. Clarke, and Kingsley Amis were the jury for a 1975 Sunday Times science fiction award. 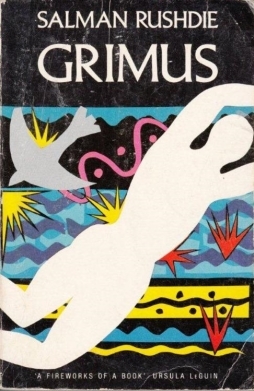 One of the books they were strongly considering for first prize was a novel called Grimus, by a 25-year-old first-time writer who worked in advertising. But as they deliberated, the publisher pulled the book from the competition, evidently because said publisher didn’t want the book given the label of ‘science fiction.’ Odd to think of the impact on the writer’s career: “Had it won,” Aldiss has been quoted as observing, “he would have been labelled a science-fiction writer, and nobody would have heard of him again.” As it happened, Salman Rushdie’s second novel, 1981’s equally-fantastic Midnight’s Children, won the Booker Prize (as well as both the 25th anniversary and the 40th anniversary “Booker of Bookers” prize, which pitted all the books that had won the prize up to those points against each other); he’s gone on to have a distinguished and controversial career, though one famously marked by the outrage his writing provoked in certain quarters. 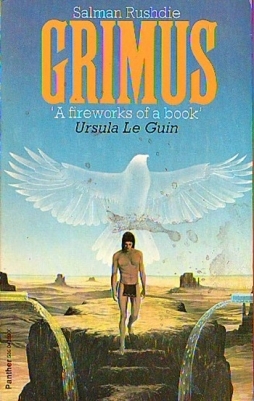 Reading Grimus, I find that, whatever his publisher might have wanted, it’s easiest to define it as that subset of fantasy called science fiction. At times, and perhaps by the end of the book, that’s even the best way in which to read it. But the novel’s so strange and supple it moves quickly and effortlessly from one genre to another, one narrative approach to the next. It reinvents its form as it goes, incorporating what came before while opening up new ways for its tale to proceed. You can see why a jury of writers would look at it as a potential prize-winner; it’s remarkable, and if I found it only sporadically involving on a human level, its fluidity of prose and image still made it work — there’s a pleasure in storytelling, here, and in the plasticity of story, in story that refuses to be bounded by any descriptor and so spills out to embrace all genres. The town was called Phoenix because it had risen from the ashes of a great fire which had completely destroyed the earlier and much larger city also called Phoenix. Nobody knew why the city had been given that name. It was a small town now. The place isn’t described in detail, nor the world around it. The book’s protagonist, an Amerindian named Flapping Eagle, is granted immortality through the actions of his sister, Bird-Dog, with whom he has an incestuous relationship. When Bird-Dog leaves his community, Flapping Eagle’s kicked out as well, and tries to find her. His search takes centuries and finally leads him into the aforementioned pocket dimension, to a place called Calf Island. His sister, it seems, is at the heart of the island, at the top of Mount Calf — a high mountain Flapping Eagle must climb, past a town of obsessives, to face the mysterious entity called Grimus. Which plot description barely hints at the strangeness of the book. It has something of the ironic, alienating effect of much so-called ‘literary’ fantasy, but also moves past irony fairly swiftly, as though it becomes increasingly fascinated with its own premises. The nature of the various dimensions through which the characters move, both inner and outer, are defined through explicitly science fictional terms — which also happen to be extremely symbolic, hinting at the nature of storytelling and perception. Overall, to me the book feels not unlike some of the sf of the British New Wave. Tonally and stylistically it’d sit nicely beside the Viriconium books, for example (something between the first two books, to be more precise). The Gorfic planet is sometimes called Thera. It winds its way around the star Nus in the Yawy Klim galaxy of the Gorfic Nirveesu. This area is the major component of the zone sometimes termed the Gorfic Endimions. The Gorfic obsession with anagram-making ranges from simple rearrangement of word-forms to the exalted level of the Divine Game of Order. The Game extends far beyond mere letter-puzzling; the vast mental powers of the Gorfs make it possible for them anagrammatically to alter their very environment and indeed their own physical make-up — in the latter case within the severe limits imposed by their somewhat grotesque given material. The Rules of the Game are known as Anagrammar; and to hold the title of Magister Anagramari is the highest desire of any living Gorf. Given the anagrams involved, it’s not surprising to learn, a paragraph or two later, that the Gorfs are shaped like enormous stone frogs. At first the anagrams of that first paragraph seem trite. But then you wonder if “Nirveesu” is a nod to the concept of “Nirvana.” Is the ‘fic’ suffix (in place of ‘ian’) meant to recall ‘fiction’? And the anagram of ‘dimension,’ “Endimions” — surely that has to do with the story of Endymion? In fact, the book consciously plays about with mythologies from around the world. The central image and metaphor of the book comes from Farid Ud ‘Din Attar’s Sufi poem “The Conference of the Birds,” in which birds seeking a king to rule them quest for the mysterious Simurg (and consider the book’s title in light of the importance of anagrams; consider also that the Simurg is frequently compared to the Phoenix). Flapping Eagle is guided to the mountain by a man named Virgil, who can’t go all the way to the end with him. Ash trees explicitly compared to Yggdrassil are found here and there. So in among all the cleverness and word-games there is the development of a syncretic mythology centering around Calf Mountain. One story bleeds into the next. You can’t draw borders between myths. Dimensions are inseparable. The town of K, partway up Mount Calf, is populated by people who’ve been swallowed up by their own obsessions as a way of coping with immortality; but it can’t last. Flapping Eagle unwittingly undermines the certainties of their lives (as an equivocal prophecy suggests is his constant fate). Appropriately, the book embodies the protean (another myth) nature it sees in story. That is: it starts as one thing, becomes another, then another, and another, reinventing itself all along the way. It seems to begin as a bitter satire, in which hapless Flapping Eagle serves an older woman as a gigolo; then becomes a weird quest-fable of a man looking for his true love; then a story about a community of grotesques; then turns inside-out once more and becomes an epic science-fictional saga about the making and unmaking of worlds. All the earlier aspects of the book are bound up in the later parts; it never forswears or undermines what comes before, but simply shifts modes, drawing strength from the variety of its previous genres, but going on to do something new. I found it seemed to echo Northrop Frye’s theory of myths in The Anatomy of Criticism: the idea that each season is symbolically embodied in a different genre of writing, with winter the season of irony, spring the season of comedy, romance (in the sense of, roughly, ‘adventure fiction’) in summer, and tragedy in autumn. Flapping Eagle’s journey seems to move along the same lines, irony to comedy to quest to a downbeat resolution. 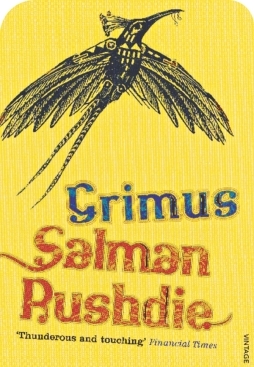 Just as Frye was engaged on the perhaps hopeless task of trying to enumerate modes and forms of story, so Rushdie seems to be trying to both emulate and undo Frye’s effort — insisting on the borderlessness of story, undermining fixity and conformity and the possibility of any kind of meaningful taxonomy of fiction. Still, however expansive, the story of the book seems to me to be best understood as mythic science fiction. 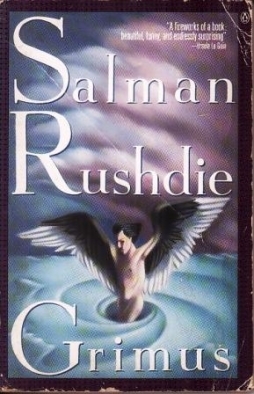 To say that is not to diminish it, but to recognise that the particular set of techniques Rushdie’s using to get at his themes are science-fictional techniques. It’s too bad that publishing realities (or publishing politics, or publishing perceptions, call it what you like) got in the way of acknowledging that on the book’s original publication. 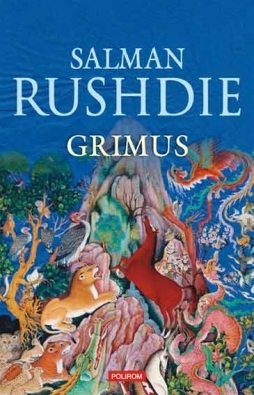 But time has passed, and with Rushdie now well-established as the writer he has become, it’s well worth looking back at his first novel and reading it in the way it demands.